As the Kansas City Public Library was starting a Twitter war during the World Series, A.R. 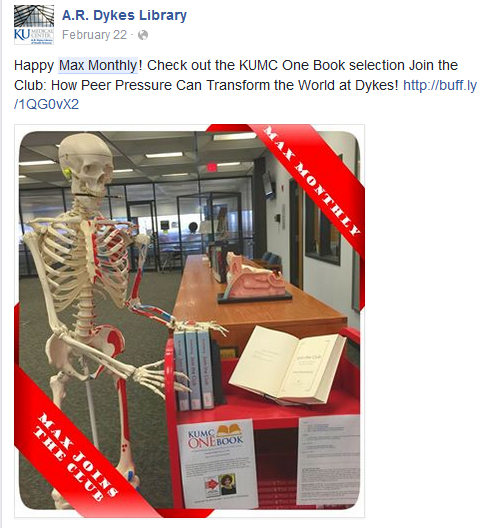 Dykes Library at the University of Kansas Medical Center was also ramping up their social media game. With a new director and vision, Dykes Library changed their strategy for engaging with library users. 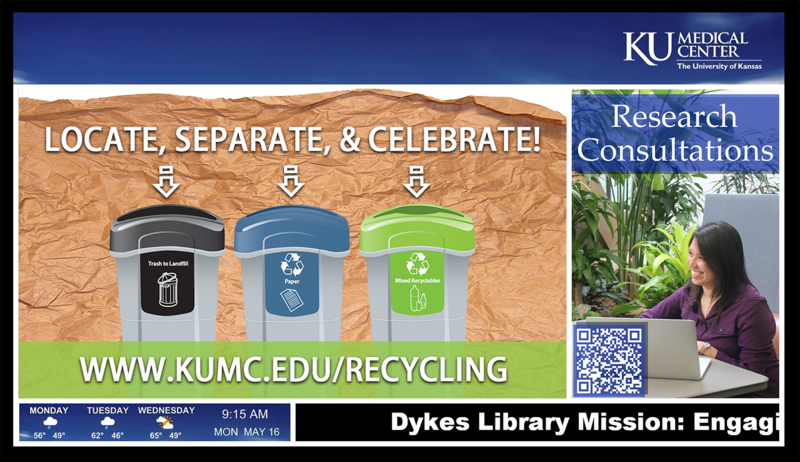 By incorporating new technologies and a dedicated marketing group, Dykes Library was able to transform digital signage, revive social media, and actively promote library services to the campus community. The first shift in library marketing came with digital signage on campus and online. Prior to Fall 2014, an older computer displaying a PowerPoint presentation greeted library users. Infrequently updated and rarely turned on, the station needed to go. Modern monitors now display images, weather, time, and date, while a customized ticker from AxisTV, a digital signage software program, replaced the old computer and shelving. Library digital signage was not the only tool that needed attention. Dykes Library social media accounts had few followers and infrequent posts. Besides a handful of library events, Facebook and Twitter lacked user activity. The marketing group sought to include already created digital signage on social media. The team started to post more on library services and health news stories. The increased activity resulted in Dykes social media accounts gaining more attention with likes, followers, and shares. The team started using Buffer to schedule daily posts. With the increased activity by staff, Dykes Library’s Facebook, Twitter, and Instagram accounts now regularly display pictures of students participating in events, newsworthy health information, and links to library services and campaigns. 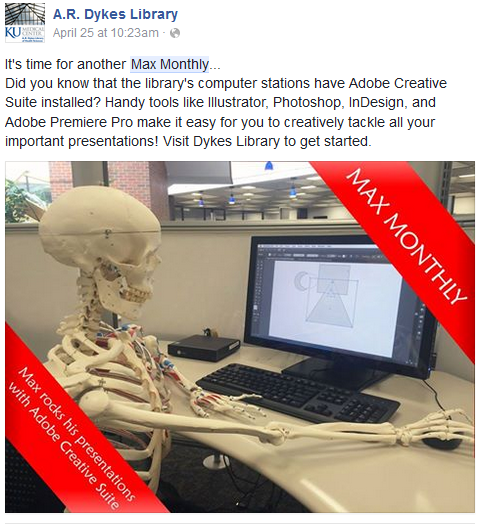 One social media campaign includes Max, the library's anatomy skeleton, available for medical students at the library. Once a month, the team posts an image of Max engaged in a library service or resource. The Max Monthly posts garners frequent loves, likes, and shares on social media. In an effort to recognize Earth Day on campus, the marketing team collected a week's worth of left behind papers from the printer. Using the website Giphy, staff created a GIF to show off the amount of paper wasted in a typical week. This post proved to be one of the most popular with over 1,300 Facebook views. The library, in partnership with landscaping services, installed and promoted new edible vegetable and herb gardens outside the library's front entrance. Library staff frequently updates social media to show progress of the gardens to students, faculty, and staff on campus. Though most of the library's marketing efforts happen online or on screens, traditional paper signage is used in the library's 13 reservable study rooms and in common areas on each floor. Changed monthly, the signs highlight important assets for students such as the research librarians, virtual chat services, exercise and standing desks, and more. A major overhaul of the paper library brochure was also completed this past year. This new brochure circulated to all new students and staff on campus, library donors, and prospective student tour groups. The most delicious marketing tool is the library's personalized fortune cookies, which promote the library website while also highlighting services and offering entertaining fortunes. Some of the fortunes read: "Have a question? 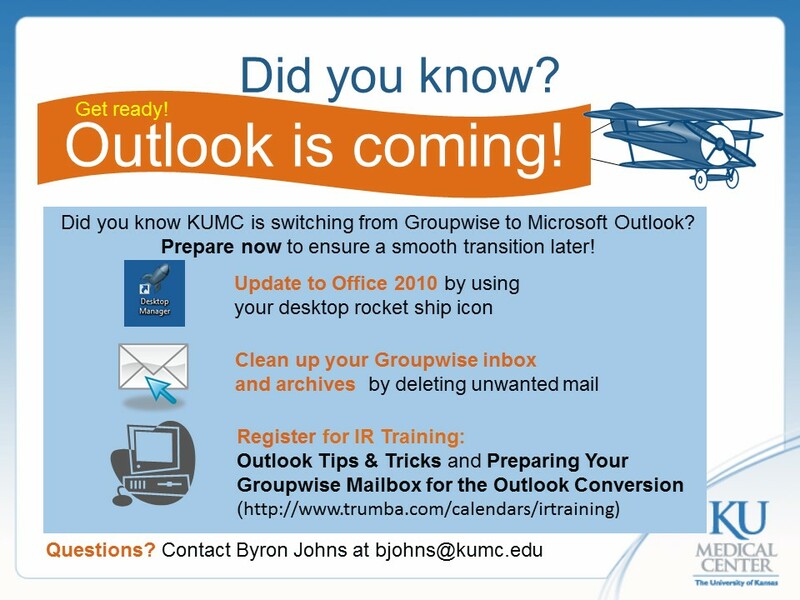 Answers @ library.kumc.edu." "It's a fact: current evidence will help your patients." "Error 404: Fortune not found..."
With each new semester, Dykes Library looks for fresh ways to connect with campus and encourage academic success. In a recent survey, students were asked how they prefer to learn about library services. The results stated that 23% preferred the digital signs, 52% email, 11% Facebook, and 36% the library website. The marketing team plans to incorporate their ideas into future promotional efforts. Julie Hartwell is a Health Sciences Librarian at the University of Kansas Medical Center. Prior to the position, she worked in the department of Teaching and Learning Technologies, where she supported Blackboard and other educational technologies. Hartwell holds a master’s degree in Library and Information Science from the University of Iowa. She may be reached at jhartwell@kumc.edu. Jameson Watkins is a dual director of Dykes Library and of Internet Development at the University of Kansas Medical Center. Contact him at jwatkins@kumc.edu. Victoria Ramirez is Manager of Interlibrary Loan in the Contact and Access department at the University of Kansas Medical Center, A.R. Dykes Library. She serves on the marketing team and can be contacted at vramirez@kumc.edu. Sara Motsinger is a Content and Access Specialist at the A.R Dykes Library of the Health Sciences at the University of Kansas Medical Center. She can be reached at smotsinger@kumc.edu. Discussion of "Technologies for Engaging Library Users Today"
Version 21 id 779021 of this page, updated 06 June 2016 by Shalin Hai-Jew. Created by Shalin Hai-Jew.